At the end of May 2001, the SA Government published its White Paper on Early Childhood Development. It said that by 2010, each of SA's 22,000 primary schools and 4,500 community-based preschool centres, should offer a nationally accredited reception year, grade R. Children will have to complete Grade R in the year that they turn six, before entering grade one in the year that they turn seven. Forty per cent of South Africa's children grow up in abject poverty and neglect. "Timely and appropriate intervention can reverse the effects of early deprivation and maximise the development of potential." Elsewhere on this website you can read about children in the Joe Slovo squatter camp in Coronation, Johannesburg, like Ashley Motshwari, Richard Kaweng, Vhongani and Khumbulani Nwandzule, all not attending school despite being of school-going age (some as old as 15 but out of school for years) and all malnourished and showing stunted growth. 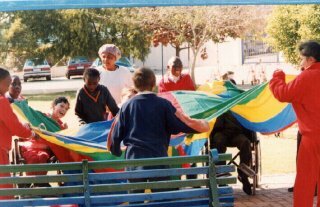 In July 2001, the SA Government published its Education White Paper 8 on Special Needs Education. Building an inclusive education and training system. The Paper states that district support services can become resources for all our schools e.g. a special school with physiotherapists must share their services with ordinary schools nearby. While theoretically acknowledging that extra costs are involved, the Department of Education appears to use every excuse possible not to spend more money. The main argument always seems to be that of not setting a precedent instead of the reverse view that a particularly unusual child can be a catalyst for growth, change and development. Indeed that learning how to cater for one child, teaches the system how to cope with many more. Sometimes the cost would be R2000 a month on a salaried classroom assistant (with some job benefits like holiday pay, sick pay and medical aid); sometimes the cost would be capital expenditure like guide rails for a low vision child. The Paper states: We will incrementally develop full service school models of inclusion. But the Department did not factor in the resistance of individual teachers, trade unions, governing bodies and sometimes the other pupils parents. It is worth remembering the resistance faced by Aids victim Nkosi Johnson, simply because his mother wished him to attend a normal school (Melpark Primary School in Melville, Johannesburg). He did eventually attend the school but people had to educate the parents first, so that they could overcome their illogical fears that were unfounded in fact. Also previous absolute rules were changed by the determination of individual parents as with the mother who took the Education Department to court, to ensure that her bright six year old daughter could start school, even though she would not turn seven until the following year. What a lot of money, time and heartache would have been saved if the fear of the precedent had been set aside and simple sanity had prevailed at the beginning. The Inclusion White Paper also refers to Early Childhood Development. But is does not mention children in hospital. Paediatric long-term patients should be a concerted focus of early intervention and should get maximum possible education while in hospital, so that lack of education does not add to their physical or emotional health problems. Dorah (see elsewhere on website) got no regular therapy let alone education while in hospital. While normal children were at least picking up vocabulary from family around them, Dorah was left twiddling her hand stumps because she had nothing else to do  for years. It is morally imperative upon the Department to rectify this first error. Let us work together to nurture our people with disabilities so that they also experience the full excitement and joy of learning. >The White Paper states that the curriculum and education system as a whole have generally failed to respond to the diverse needs of the learner population. It is infinitely cheaper for the SA Government if a disabled child is raised in a family home, even if the family are lucky enough to receive a foster grant, than for such a child to be placed in a permanent childrens home and/or boarding school or so-called special school. The White Paper refers to the R11000 a year spent by Gauteng Province per pupil that compares poorly with the R28600 spent by the Western Cape. The difference between these sums is not far off the cost of employing a classroom assistant. If one adds in the weighting of four given for a physically disabled child and of six given to a blind child, and the sums arguably due for the education of a multiple disability child move closer towards the cost of teachers and therapists salaries that are needed. P18 of the White Paper refers to: Development of learners strengths and competencies rather than focusing on their shortcomings only. This is the theory but not the reality. There is no school in Greater Johannesburg that would willingly take in a blind pupil in August 2002. Education Minister: Kader Asmal 012 312 0126 / 5501; 021 465 7350. Edcent Williams 012 312 5281 Chief Director Curriculum Assessment. There are a lot of private assessment clinics being set up, often using the premises of established schools at weekends and appearing to be an official extension of their activities, but actually run as private businesses. The clinics claim they can assess the abilities of a complex child in anything from ten minutes to two hours. They will charge families as much as R1200 for such assessments, sometimes using tests that would be described as archaic in the northern hemisphere. Always ask what choices you have in terms of assessment and what fee, if any, is expected. If you are a low income or no income family, make this clear before any assessment takes place. Also: Ria Mathiva 011 408 9348, Educon Building, 125 Simmonds Street, Braamfontein, Johannesburg. Exemptions (i.e. permission for a child not to be in conventional schooling in the year that they turn seven): Maureen Mcineka 011 408 9347; Dalene Louw 011 408 9312/9205. Unhelpful: Lindy Mngqibisa (refuses to explain what she does - even though exemption colleagues put people through to her). Based at 32-64,1st Avenue, Melville, Johannesburg. Tel: 011 482 3520; fax 011 482 4303. The principal is Amanda Fallick. This school has a very wide catchment area, extending as far as Springs on the Far East Rand. Its fees are R3500 a year (R350 usually paid over a ten month calendar) [August 2002]. Bus transport is extra and rates charged depend on distance. The school takes in children with problems like Downs Syndrome but is largely made up of pupils that just need a bridging programme to get into ordinary state schools. Many pupils are from a rural background and have started school very late or had poor quality schooling. The school runs from Grade 1 to Grade 7. It is based in the C2 Education District but is largely funded by donations to the Sparrow Schools Educational Trust, with a mere R800 payment per pupil per year from Gauteng Education Department. The buildings are full to bursting, and there are even two prefabricated classrooms with possibly room to build one more. There is a nearly full size soccer pitch and a smaller games field at the other end. The school would like to acquire the nearby old Melville library building to use for additional classes, but that seems to now be destined for commercial development. The school includes a Progress Centre, described as Intervention of Minimal Brain Dysfunction pupils. "The focus is on acquisition of life and economy supportive skills and competencies that will enable the pupils to play a functional role in society. There is a range of individual enrichment programmes." There is also a High School based at St Joseph's Children's Home, corner Good and Herman Streets, Sophiatown (previously known as Triomf). Sinetemba School for deaf and blind, Katlehong. No. 1, Mofokeng Section, Katlehong. The combined nursery, primary and secondary school has 360 pupils of whom 220 are in hostels and the rest come daily. More than one teacher complains of the school not functioning as well as it could, due to internal infighting. She said that the curriculum needed to be overhauled to become more relevant. The school teaches Braille and signing. Teachers say it is harder for deaf pupils to find employment than for blind pupils (who typically work as receptionists), because the general public cant sign and arent willing to learn. The profoundly deaf cannot lip-read as a little hearing is needed even to understand lip reading. She complained that employers consider deaf people aggressive because of this communication gap. They suggested the Department of Education should lead the way by employing more disabled people. There is a waiting list for pupils wanting to enter the school. The Dept of Education has frozen the posts at the school so they have been unable to employ someone to teach the bridging class that allows for some remedial problems to be sorted out. The school is no longer accepting learners for the hostel because it is full. The buses only serve Katlehong, Vosurus and other areas close by. There are 100 blind pupils and many more deaf children could be admitted if there was space. Children can start at age 3 in the pre-school. Physically disabled children are referred to Zimelane School for physically disabled children. The school does not teach Moon (the language similar to, but simpler than, Braille, that could maybe be learned by children who have no fingers). The school is in what was once known as Sybrandt van Niekerk Laerskool, in Kliprivier, some 40 km from Johannesburg. Sibonile is one of several schools intended for pupils with visual impairment in Gauteng province. It is a primary school (up to Grade 7) with boarding facilities. The late Mr E Ncala, initally seeking a solution to the education of his own child, persuaded the National Organisation for the Blind in South Africa (NOBSA) to be sponsors and the school (number XA86) was registered on the 16 February 1994. Sibonile is a state-subsidised school and has pupils who are partially sighted; pupils who are totally blind; pupils with visual and mental problems; and pupils who are deaf-blind. It also has some pupils who can see normally. There is no training centre for the visually impaired in and around Gauteng province except for sheltered workshops. Pupils aged 20 years old and above want to attend at Sibonile but are denied because of age limits. The school has very slow learners with no hope of leaving the school in the near future e.g. seventeen year olds in a special stimulation class. There is a dire need for a vocational training centre through which many of the visually impaired would be able to gain a measure of independence and employment. Parents of a former pupil commented in 2001 that the (now former) principal of the school was most inspired (he moved on to the special needs School of Excellence in Germiston) but that this did not necessarily follow through to his teaching staff and least of all through to the housemothers. One parent feared hygiene problems in the dormitories and alleged lack of supervision over sighted boys playing with blind boys. Some Sibonile staff have had specialist training overseas for brief periods. The variety of languages used in the school - including signing for the deaf - can be confusing to some blind pupils. Neither Braille nor Moon is taught. The school has a waiting list of 10 children in August 2002 and has 124 pupils of which about a quarter are totally blind. They are accommodated in 9 classrooms where 7 teachers and 1 class aid are responsible for their tuition. There is a farm school on the same site but there is no shared teaching. Officially still part of Johannesburg Hospital School - an ELSEN school - the TMI visually impaired crèche is on the first floor of TMI, 13 Joubert Street Extension, Parktown (just on the edge of Hillbrow, just off Empire Road). The TMI facility is aimed at pre-school children but in 2001 it claimed to be still trying to be reclassified as a section of an Early Learning Special Educational Needs (ELSEN) school. That would in theory allow it to take in a wider age range than the SA Government's currently favoured scheme to only assist Grade R classes - the reception year before Grade 0 of primary school. However, as an ELSEN school it would have to be attached to a larger existing ELSEN school, possibly functioning as a satellite. The current principal would be unable to retain a principal's post if the school was reclassified, as one cannot be a principal of a satellite facility with a mere dozen pupils. If the school is not reclassified, it will close and both teachers would have to be redeployed or retrenched. One teacher was away from June to October 2001 and is trying to emigrate. Gauteng's Department of Education had tried to close the TMI school in December 2000 (in common with 90 other pre-schools) but the teachers' trade union took the province to court and it has a stay of execution for more than a year. The school, based on the edge of Parktown and Hillbrow in Johannesburg, has a teacher:pupil ratio on average of 1:6. It says that looking after one blind child is as hard as looking after six ordinary children. It equated looking after Dorah Mokoena as being the equivalent of ten ordinary children, because she had also lost her hands through injury. TMI has a paediatrician who assesses children on admission but who is not visibly involved in day to day activities, and very rare access in school hours to speech therapy and physiotherapy students. The school had a private grant to employ an occupational therapist. The school has only two teachers, neither of them with significant specialist training in the field of disability or low vision. This lack of expertise is not immediately apparent because of the good facilities. These date back largely to when the Visually Impaired Unit was founded, partly as an offshoot of the Johannesburg Hospital School, by people with direct training in the needs of visually impaired children. TMI's contract staff member with the most experience, Elzet Utley, left in May 2001 to take on a more challenging role on inclusion of disabled children into mainstream education for the Catholic schools of South Africa. Ms Utley herself had suffered from low vision and as an occupational therapist, had good ideas for the pupils that cannot now be readily followed through. A highly experienced classroom assistant Elaine, who had undergone some specialist training, also left in April 2001. TMI facilities including a small heated physio pool (despite being heated it is only used for a small part of the year); a sand and water stimulation room; an occupational therapy gym and a trailing "feely" walled room, designed by students from the University of the Witwatersrand to encourage blind children to explore. There is a pleasant outside playground for warm weather use, with mostly baby-size equipment. Teaching staff are paid by Gauteng Education Department to be on site from a minimum of either 7am to 2pm every weekday or from 8am to 3pm every weekday. Despite no teaching of children taking place beyond 12.30pm each day, there seems to be no time to repair facilities in urgent need of repair. Parts of the "feely wall" steadily fell off 2000 and 2001 and were not glued back on or replaced. Prior to repainting of corridors with very Eurocentric images in June 2001, a Braille frieze of numbers had been left incomplete for two years. 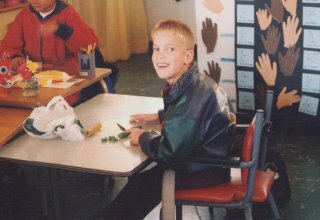 No one at TMI is qualified to teach children Braille or Moon but certainly one pupil in 2000 was ready to learn and was frustrated with nothing to stretch him mentally. The two teachers did attend (part of) a workshop on the needs of multiple disability children in October 2000 but the ideas from the course did not seem to be followed through in practice. E.g. the lecturer pointed out how little meaning toy plastic animals have for a visually impaired child - to the child they are just cold hard lumps of plastic that don't even remotely represent the scale of the creature under discussion, let alone any of its other attributes. It is far more effective to bring in a live animal or to get into close contact on a farm or in a children's zoo, or to at least touch the skin of a cow, to smell a cat or to hear the roar of a lion. Yet the next week, inert cold hard lumps of plastic miniature animals were again on display in the classroom. Dorah Mokoena started attending TMI part time, in 1999. She became a five-day-a-week pupil at the school from mid April 2000 and remained there until October 2001, with breaks away for operations. Despite the school's shortcomings, Dorah generally enjoyed going to school - particularly the company of her classmates. She regressed a little when she was off sick for two weeks and returned to many changes - including the loss of her friend the classroom assistant. She also misses the company of a slightly autistic fellow pupil who was moved to the other class. Dorah liked games like rolling a ball across the table to other pupils, rolling play dough, making paintings with her "hands" with edible paints and she became a lively dancer if her arms are held. Dorah could sing the melody of Frere Jacques; Twinkle Twinkle Little Star; Baa Baa Black Sheep; Away in a Manger; This old man, he played two; Three Blind Mice; Happy Birthday; If you're happy and you know it, clap your hands (with clapping); and parts of many other songs. Her recognisable speech remained very limited at TMI except for those who knew her very well. She uses a phrase "yukk-a yukk-a" for "yes sir, yes sir" in Baa Baa Black Sheep. She sang "yappy yappy" for "If you're happy and you know it ..."
In May 2001 she produced a clear but very quiet sentence "I ont eat" as in "I want to eat". Dorah's speech is from the back of her throat. She rarely repeats anything but expects people to hear it first time. This speech problem is also noticed in cleft palate children. Dr Leanne Sykes from the University of the Witwatersrand says: "Motor patterns of speech develop during the first 12 months of life. If the patient has not had palatal repair during this time, compensatory speech patterns may develop such as abnormal pharyngeal and glottal constrictions that produce speech that is often unintelligible. Unlike the hypernasality of vowel sounds or nasal emission on consonant sounds which can be corrected surgically, the compensatory articulations that develop prior to surgery are not alleviated by the surgical repair." Sykes goes on to explain how eating prosthesis can also aid speech if used at the right time. Much of this would also have applied to Dorah if anyone in Far East Rand Hospital had been made aware of the consequences of leaving her burned mouth largely untreated for three years. Teachers (including those at special schools and nurseries) similarly need to understand that a child not speaking does not mean that the child is stupid. Dorah's sight deteriorated after the failed corneal graft (and infection) in September 1999 but she still strobes her arm in front of her eyes in response to light. She settled very happily into her home in Auckland Park and while still at TMI she became fairly mobile on her knees and standing, both inside the house and in the garden, particularly in warm weather. One of her favourite activities became swinging alarmingly high and to climb the ladder on the jungle gym. After sending various volunteers to TMI it became clear that Dorah was never taken over the jungle gym there nor used the slide, nor the see-saw. Whatever she was nervous off, was simply put off-limits and when a large classroom assistant was employed, vital exercise for children of walking down the stairs stopped because the assistant herself preferred the lift. Fees at TMI increased from R200 to R500 a month in mid 2000. The teachers are, however, paid by Gauteng Department of Education and the facilities are paid for by the Department of Health. In addition the school fundraises and has donations from a variety of outside sources, including the Nathan Trust. The school had a reserve fund of at least R45 000 (May 2001). Most parents don't pay R500. The other pupils at the school in June 2001 were: Refiloe Mokgoale, a blind Sotho girl. Mbulelo Makapela, a boy with little vision. Karabo Mashaba. A girl with little vision. Donald Albertus. A lively boy. Michael Dlamini. A blind boy who is frequently ill. Kgadi Masetlwa. Raeez Kuhn. A lively little boy. Bhaveen Patel. A boy. Zukiswa Kaizer. Shannon Stone. A very lively little girl. A trained nanny Zanele Cele visited TMI on Thursday September 27th, 2001. She wrote: I visited TMIs visually impaired crèche for some three hours in the morning. A woman called Jane was the principal and a large woman called Melanie was the assistant. I went to visit the school to see how do they work with Dorah so that I can use their method when I am with Dorah. To my surprise nothing was being done to Dorah, she was standing on own for two hour. No one was paying any attention at all as if Dorah was not there. The lady in a white jersey and navy blue skirt (Refiloes mother but she is not allowed to play with her child when she is at school) who was present on that day told me that there is nothing they can do because Dorah cannot even see. She also told me Dorah is only allowed to play on the swing, not on the jungle gym nor slide because she might fall and hurt herself. And if something can happen to Dorah they will held responsible. To my understanding, they want to prevent the damage rather than curing it, in other words they think that it better not to play with Dorah than to let her fall, forgetting that if person let alone the disabled child stand for more than an hour her legs become stiff. There was also a distance between teachers and children all the time outdoors; the lady told me that children are not allowed to move around grown ups. To my understanding children feel secure if a person who is looking after them shows love, they tend to trust that person more them anyone. Children are not even allowed to touch any adults at TMI. The children were playing with marbles; I think a child can swallow the marble easy. The sand play was closed, which I think could have been of use to Dorah who was standing for ages and doing nothing. Fees per year (2002): R5300 hostel accommodation; R5000 tuition. The Hope School has got good facilities for mainly physically disabled children, including one internationally-experienced speech therapist as well as physiotherapy and occupational therapy staff. As there are no classroom assistants, the therapists have to fetch the pupils from the classes themselves, eating into the time available for therapy, though they seem to get a little assistance from University of the Witwatersrand students. It has got a well-equipped computer room for some 20 pupils, an outdoor swimming pool, an indoor heated physio pool and lots of easy ramps and walkways for wheelchair use. There are 11 nursing sisters who will be cut to only one by the end of 2002. Some are day pupils but all the children now have to go home at weekends even though this means a three day trip there and back for one pupil from Tzaneen, every week. Other pupils come from Warmbaths and Witbank, Alex and Soweto. Because of the high cost of traveling every week, one boy in Witbank has ceased schooling at the age of 16 (2002). His parents are unemployed and could not afford for him to finish his schooling. Eighty pupils sleep in hostels  45 boys in what was once intended as the Training Centre and 35 girls in a separate hostel. There is one matron with13 housemothers and eight cleaners. Professional staff are predominantly Afrikaans. In August 2002, a shortage of funding for teachers had led the school to teach grades one, two and three pupils all together in one English class and one Afrikaans class. Grades four and five are also combined. The school operates on a seven working day cycle (i.e. 1mon 2tues 3weds 4thur 5fri 6mon 7tues)  the idea being that children who e.g. always go to hospital on a Tuesday dont always miss the same lesson at school. Lessons are 45 minutes long. The teachers complained not only at the difficulty of teaching such a wide range of ages and abilities, but also at how time taken for 6-7 children out of a class of 17, to attend therapy, be catheterised (half hour process at 9am and at 12 noon), or even attend hospital for calipers, prosthesis or operations, disrupted the classes. The children who are not being given therapy, need to remain occupied. The children temporarily out of the class have to catch up on their return. There are also disruptions to accommodate Prof. Erken the orthopaedic surgeon, when needed as well as Prof. George and Dr. Cornish. If children soil themselves in class, housemothers come to the class to help clean them and the whole room if need be. They described a young gifted girl who was being held back by the progress of her classmates. If youre not going to stimulate her, youre going to eventually lose her. The same of course applies to a complicated child who might just be left out of the loop, simply because she is hard to teach rather than being inherently stupid. The school is in a wonderful setting with inspiring views right across Johannesburg. The site belongs to Oxford University in the UK and the land cannot be used for any purpose other than a school for the disabled without their agreement. Some staff have commented on difficulties in ensuring children like Irene (see below) follow instructions from hospital or their guardians, as the pupils were so privileged in the elegant surroundings and low pupil-staff ratio (sometimes only one teacher to six pupils) that they took it all for granted, and some behaved quite ungraciously towards their carers. The school takes some slow learners but will not take blind children. The principal is Gerd Viljoen. It also includes a nursery school run by a volunteer in May 2001 and later run by a young speech therapist  because there was no one else to do so. One child assisted by Children of Fire attends the school. Her name is Irene Peta. Another child "Sissi" who attended TMI was refused a place at Hope School in 2001 because of her limited sight and yet was also turned away from Prinzhof in Pretoria, despite her elder sister already attending the school. She was eventually accepted at Forest Town. This (boarding) school teaches Braille but the staff were unaware of the existence of an easier option, Moon. The communication language used is mostly Afrikaans. On a visit to the school, one child could clearly see well, so the criteria for admission are uncertain. Con Amore is in Sable Road, Kempton Park, near Johannesburg International Airport. Tel: 011 976 1037 (Principal Mrs Kumi Gieselbach). It is a school aimed at mentally disabled children. Where possible the pupils are taught mathematics, reading and writing. Otherwise the focus is on handiwork and self-care. There is a speech therapist and an occupational therapist, but the children are taken in groups rather than receiving individual therapy. Parents of a Downs Syndrome teenager at the school said that they were happy with the school and that the fees are reasonable. In May 2001 they were paying R225 a month including bus transport to the school and a good meal in the middle of the day. Bus costs depend on distance from the school. It would not collect pupils from the other side of Johannesburg (e.g. not from Auckland Park). The school day runs from 8am to 1.30pm. The school does not really cater for children with physical handicaps though there is one girl there without arms. One parents described her son: "My son can only read a few words and has a hearing problem. He benefits from being part of a normal family but it is hard now that his two teenage sisters go out and he has to always stay behind. They are a bit embarrassed about him, but it is just at this age. Meeting other parents helped me realise that I wasn't the only one in the world with a child like this. We've also been very lucky outside the school as Dirkie Visser, a psychologist from Muriel Brand school, has been kind enough to give my son individual Sunday School classes for the past eight years. I think she will continue until he takes Communion. That attention is an important part of his life." Private Bag X2, Parkview 2122, New Forest Road, Forest Town, Johannesburg. School image: A phoenix rising from the flames and the word Arise. Forest Town School was founded in 1947 by a group of parents of children with cerebral palsy. The school is still primarily for CP children as well as children with learning disorders or who are neurologically impaired. The pre-primary accepts children from three years old. 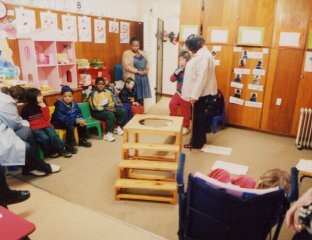 A class of grade ones seen in 2002 had auditory and perception problems, so they played games with flashcards, lots of learning games, making stepping stones (literally) with words, and carried out addition, subtraction, letterland  all slower than a normal school but the same learning areas. The children had more letter reversals (i.e. writing mirror images of letters) than other early writers might have. A parent described the school as having a strict interview to look at children's intelligence before admitting them. Many pupils have learning problems or attention deficit disorder. Some children cannot sit unaided; some cannot walk at all. One mother described her son wanting to speak but people being so impatient that they did not wait for his answer and so did not recognise that he could speak for a long time. Generally the school was praised by parents though some had had difficulties with particular teachers and the ones whose children had been rejected by the school did not like it at all. There are typically 13 to 16 pupils to one teacher, and one classroom assistant for four classes. Below: Little girl with glasses in front of jungle gym. 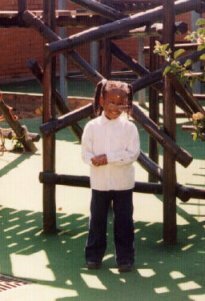 This little girl used to attend the crèche at TMI and, despite her low vision, was accepted at the school... allegedly because of floppy limbs. She was turned away from the Hope School and also from the Prinzhof School in Pretoria. She can climb the jungle gym and her vision was good enough to recognise her former classmate Dorah when we visited the school. Dorah was turned down by Forest Town. Fees for an 8am to 12.30pm day are R520 a month (August 2002) and include no food. Aftercare at extra cost is being considered. The speech, physiotherapy, and occupational therapists are "superb" according to parents and a few children get two occupational therapy, two speech therapy and two physiotherapy sessions a week (usually in groups), but in August 2002 the wait to be taken on by the speech therapist was several months. There is also a psychologist and a paediatrician available. The school has some visually impaired children. Some children are accompanied by their own facilitators - but their parents have to meet that staffing cost. In common with many schools for able-bodied or disabled children, the quality of parental involvement (or lack of it) helps determine what the child can achieve. Assessments carried out at the school are usually charged for. While not aimed at blind children, the hand railing around most of the school and the flat layout, would be ideal for them. 85 First Avenue (corner First Street), Linden, Johannesburg. Tel: 011 782 0231 Fax: 011 782 7736. The school has a government subsidy and is under the jurisdiction of the Education Department but is managed by a governing body and an association that fund-raises to meet the shortfall in running costs. It usually has a waiting list "for low functioning children"
including those with attention deficit disorder, Down Syndrome, cerebral palsy, epilepsy, Fragile X Syndrome, and brain damage. It has 170 pupils (August 2002), a part-time occupational therapist, no speech therapist and a physiotherapist occasionally. It has no blind pupils and one assistant to every 15 pupils. The school includes cerebral palsy children, autism and special ed. There was a waiting list of 16 children in August 2002. Parents have to pay R390 a month and R140 for aftercare. The classroom assistant ratio is not maintained continuously because of leave, sickness, etc. Visiting one classroom, the ten children were staring in different directions, unable to speak clearly, some were crying. The teacher was using gestures to describe a banana (i.e. showing a peeling motion with her hands) and using a chart of vegetable pictures. This would not teach a blind child anything, so there are no blind children in the school (August 2002). In another class the children had pre-school level Bible pictures to colour in but most were scribbled over. (There was no mention of how children from families with other religious backgrounds would be catered for, presuming that the children actually even understood what the Bible was.) There were little plastic animals to play with. There were also pictures for the child to draw along curvy lines, etc. Another class had children making large simple jigsaw puzzles (with about 10-15 pieces) and some succeeded. There was a small dog in the class and the pupils were mostly white. Outside there was a very small sandpit and baby swings. Some children apparently use the Makaton system of signing. A cubic piece of wooden furniture containing the cut-outs of a square, triangle and circle was used with a plank of wood at a gentle incline to the top of it. The children walked: one step, two step, three step, four until the top and then were told to get into the box and find the circle or triangle or square and then to climb out through that shape. With one rather fat boy, his only option was the square as he would not have got through the other shapes. along the lines of we-are-here. Some tried to repeat what another child had said, rather than reading. One child grunted continuously like a pig. A small stimulation room contained three small exercise mats, one large physiotherapy ball (see the springing exercise described under Dorah Exercises on the website) and a tube-like stuffed cushion to swing on. Baby jungle gyms were visible outside and a disused (full of leaves) sandpit. Children are said to learn: pottery, carpet making, weaving, sewing, knitting, woodwork, gardening, computers and cooking. The brochure describes activities such as horse riding but this is clearly off-site.  complete with gestures to indicate the old man (hand stroking imaginary beard), a finger held up to show the number one, and other signs e.g. hands/fingers pointed together in an inverted V over the head to show home. A blind multiple disability child could learn some of these signs within the limitations of missing body parts, but would not see the other children or teacher doing them. She could obviously not hold up 1 or 2 or 3 fingers if she had no fingers to start with. The number cards on the floor that the children then had to choose (only two pupils could do so accurately or were even interested in doing so), could not be seen by a blind child. Most of the activity and the pleasure in doing it and learning from it, would be lost on a blind child. Two children were not involved at all, but were sitting behind a chair, putting plastic discs into a container tidying up. Debbie the teacher looked extremely tired. It seemed that the children were all of very different abilities and some were consistently disruptive, making it hard for the brighter ones to progress. The class is small, cramped, and it would not be possible to keep all the furniture in the same place  and yet this is the sort of infrastructure that a blind child needs with which to orientate herself. An Education Department committee were urging the placing of a blind child in the school in August 2002 because there was no other option in her education district or adjacent to it. But the teacher was dubious as to whether she would cope with any more complexity in the class and both she and the Principal said it would be impossible to guarantee the safety of the childs prosthetic stick-on nose as children had previously flushed the hearing aid of another pupil down the toilet. The nose, valued at some R3000, can fall off at any time of day. Also the hyperactive children were seen as a real risk to the physical safety of a blind child (especially one already wearing a safety helmet) as she could not see to defend herself if they became aggressive or simply too lively. The whole classroom was full of visually-stimulating material  not auditory or tactile stimulatory material. It was too cramped; the teacher too tired. When would there be time train a teacher to know how to teach a blind child? The children would hold a bright blind child back. Even if the Education Department recommended a placement in the school, the Governing Body would have a say and despite all the pledges not to disrupt childrens lives, even Casa do Sol has a three month probationary period after which they can say that the child cannot be taught in their existing classes and must go. Van Dalen street, Ruimsig, Roodepoort. Tel: 011 958 2080. Semi-state-run. 25 Arkwright Avenue, Wynberg, Alexandra Township. Tel: 011 786 9806. Described by one teaching professional as "not nice at all and a dangerous area to drive in." State-run. The school is targeted for gradual improvement under a government plan for the regeneration of Alexandra. Fees are a mere R50 a month but the very impoverished community the school serves, struggles to pay even that. Theft of equipment like computers adds to the problems. A physiotherapist visits for one morning a month during term time - a total of eight mornings a year. Being adjacent to the Alexandra Health Centre (itself under constant financial threat of closure) allows easy (basic) medical treatment for the children. The brightest children are taught embroidery, painting, woodwork, leatherwork - making items like pillows and purses for sale. Children's success is measured in terms of whether they can recognise colours and whether they can count to ten or to 20. Some are described as unable to count "due to their speech impairment" but this does not explain if they understand numbers and simply cannot articulate what they understand. The children sweep their own classrooms and wash their dishes in the kitchen. Bible stories are told under the life skills section of the curriculum. Some of the children get an annual holiday to the seaside. The school struggles to exist financially. A state school, with a bus link to Woodside Sanctuary and neighbouring suburbs. It is based at 24 Cressy Street, Kensington, Johannesburg. Tel 011 618 2300. The Principal is Mrs Singh. Her Head of Department is Mimi le Roux. The school has some very severely disabled children, from little girls with excessively small heads to wheelchair-bound boys who have to be strapped in and spastic girls whose hands are permanently contorted and effectively unusable, but who can nonetheless paint with their feet. The children seen on a visit to the school were generally clean, happy and being well-stimulated within their limitations. They wear a scarlet tracksuit uniform. A volunteer was playing the piano to one class, with all the pupils singing along happily. In the class with the brightest pupils, a variety of activities were going on - from sewing (large stitches across a piece of cloth) to knitting (by winding wool around wooden pegs on a board, rather than using knitting needles) to drawing. Lesley Hudson teaches that class and was open to the idea of taking a visually impaired child in, but the school nurse and therapists said that it was "against admissions policy". Other children were playing sports outside. For some wheelchair-bound boys this meant simply holding a corner of a bright rectangular cloth and using what hand movement they had to move the cloth, and thence to move the ball. The only swings available are "baby swings". 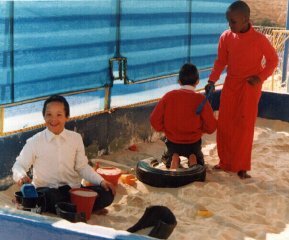 Some children played in a large shared sandpit; some other children played (sitting on chairs or wheelchairs) alongside with individual "sand tables". The fees in June 2001 were R220 a month and R180 a month for bus transport to and from the school. Pupils must bring their own sandwiches. The school refuses admission to blind or low vision pupils "because it does not have appropriately trained staff." While the different topographical levels of the school and lack of appropriate railings would make it much more difficult to navigate than a school like Forest Town, blind walking children would be no more complicated than many of the wheelchair-bound children. The fees are R2266 a month (August 2002) but the actual cost of running the home is R3700 per child per month. It has severely to profoundly mentally disabled children right through to adults, boarding at the home. The brightest residents go to "stimulation" classes but these too are quite limited. Many sit on beanbags and watch television. It is a "cushioned environment" which would not optimise a low vision child's development - such children need hard surfaces e.g. wood, to hear where they are going and to get sound stimulation from things touching or falling on interestingly acoustic surfaces. One blind 33-year-old resident can knit a little. He is the only blind resident. Some of the "brightest" pupils go daily by bus to Doug Whitehead school, leaving around 7am and returning around 2pm. There are two children who live with their families and just attend the centre daily. There is a strong Afrikaans influence and staff seemed to find it hard to comprehend that a black child might not understand either Afrikaans or a "black" language. Children and adults who attend the stimulation class, have Bible study sessions. One teacher seemed lost when asked about representing other religious perspectives but said that he hadn't had to face the "problem" to date as the only Moslem resident was too "low functioning" to attend such classes in any case. May 2001. A physiotherapist attends twice a week but has three physio assistants. Four OT students from Wits University attend over five week periods. The home would like a permanent occupational therapist. 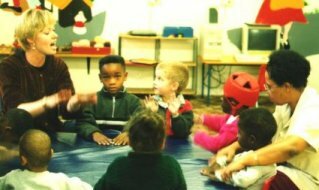 A volunteer (August 2002) comes twice a week to carry out a brain dynamics programme with eight children, over a three month period. It is sad place of strange-shaped nodding folk; children in walking rings that aimlessly travel the floor, bumping into a strangers legs repeatedly, unaware that they are causing pain. Adults grab ones hands or clothing and stare or gibber or ask nonsensical questions like: When did you come from Scotland? but have no interest in the answer. Other adults knot pieces of string over parcels in a pushchair for fun, or flick through magazines unable to read and not interested in the pictures. This school is fighting a battle with government (May 2001), as it has been told to cut down the 28 house mothers to a total of six - and yet most of the children need a great deal of care. 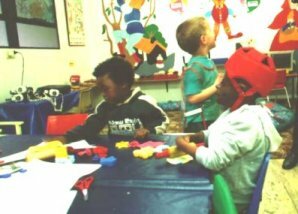 Sunshine Schools - preschools for disabled children, run privately. A base at TMI and also in Craighall Park. Castor Road, Fisher's Hill, Johannesburg. For mentally disabled children. Privately run, costing R800 or more a child a month (June 2001). Privately run school for disabled children costing R1300 a month (June 2001). A low income parent said that his child would have to be taken out of the school as a promised subsidy towards the high fees was not forthcoming. A training centre for low IQ young adults. Private Bag X04, Brixton, Johannesburg 2019. This primary school in Mayfair caters for ordinary children with a strong sense of discipline and a multi-faith (Hindu, Christian, Muslim) and multicultural base. It has two special classes for young pupils and for older pupils. Children who are slow learners for a variety of reasons are placed in these classes. The school admitted a pupil with delayed development due to prolonged hospitalisation, and with no useful vision and no hands in October 2001 and she continued as a pupil until August 2002. Initially the school prepared wonderfully for this very unusual looking pupil but the class teacher had decided to seek a better-paid job in 2001 and succeeded in obtaining such a position in June 2002. The Department of Education refused to fund a vital classroom assistant for the little girl. And the school principal who had supported the policy of inclusion, was murdered in a robbery in mid 2002. The logical step is to equip EP Baumann to be the Johannesburg Primary School specialising in inclusion to help low vision and blind children. The extra cost burden on the school of an assistant made the governing body less than warm towards the pupil and they alleged that her presence slowed down the other learners. The school was difficult for a blind learner to navigate around because there were no railings. The policy of inclusion is pointless if the SA government will not put money where its mouth is.